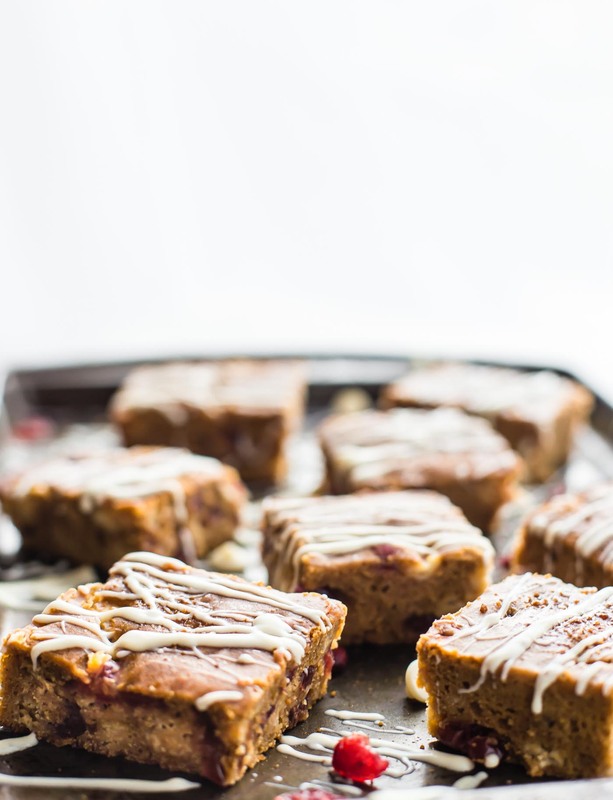 Cranberry White Chocolate Pumpkin Bars are a “healthier” easy dessert! 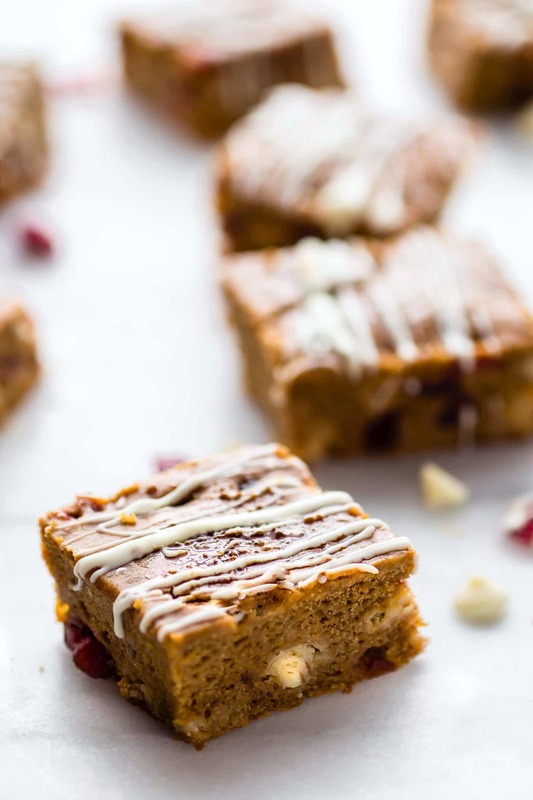 Gluten free cranberry white chocolate bars with pumpkin, that are made egg free! Super quick to whip up in under an hour! A great holiday dessert or for every day snacking. 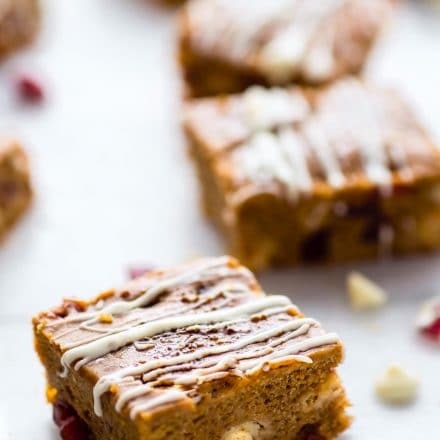 **NOTE: This Healthy Pumpkin Bars recipe was originally published in Fall 2014. I updated the photos and the refined the recipe. Now I’m republishing the updated recipe because it’s WAY better! We are SOOO in the thick of holiday gift giving and chocolate’s galore! In fact, my husband just received a delivery full of white chocolate and other goodies. You see My husband’s (aka Kiwi Cotter) favorite candy of all time is white chocolate, the milk bar brand from New Zealand to be exact. And every time we head into off season, he gets a care package from his “mum” with white chocolate included. Full proof on his instagram feed! I’d say chocolate is a pretty good way to enjoy the season, yes? Well, I like to keep that little ritual going but also add in my “healthified” and “gluten free” version to keep the body from going into sugar shock. Yes, it is do-able! All you have to do adjust a few ingredients to make that treat stretch further (nutrition wise). Now, please hear me out. 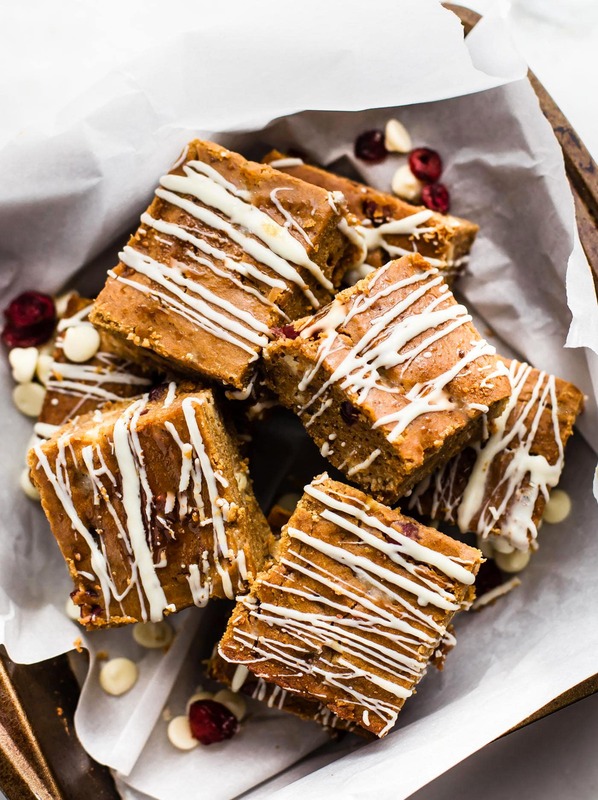 This Healthier Cranberry White Chocolate Pumpkin Bars recipe is by no means SUPER CLEAN (eek, don’t like that word). To me, healthifying a chocolate pumpkin bar recipe means focusing on REAL ingredients, and maybe even adding a secret superfood ingredient. Yep. That works! What real foods you ask? I mean no preservatives, natural sugars, and healthy fats to round it out! Which is what these are my “semi-healthy” Holiday Cranberry White Chocolate Pumpkin Bars! I can sense your sweet tooth agreeing with me! What’s in these super moist pumpkin bars? tiger nut flour, which is a resistant starch and great for the gut flora (thank you Lucie for getting me hooked). Shhh… just don’t tell the other you added in a good for you ingredient. 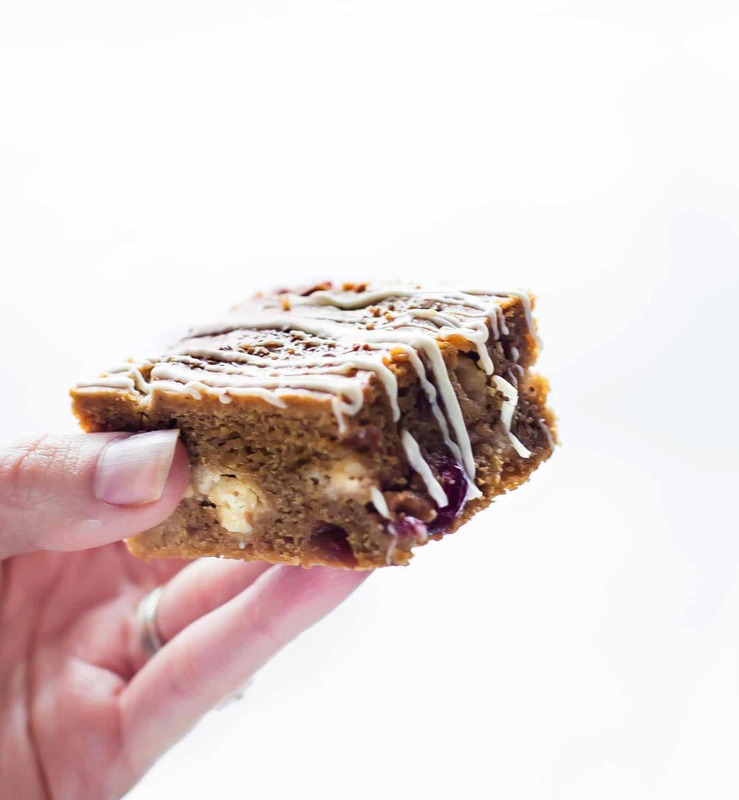 You see, you get your cranberry white chocolate fix, in pumpkin bar form, and it be GOOD better for you! Oh, I should also mention, if you are not vegan, then the white chocolate baking bar from Ghirardelli is great because it has no other additives. Just milk fat, sugar, cocoa butter, etc. 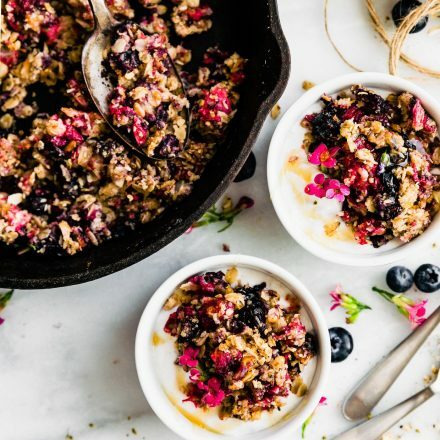 You can also make this with dried cranberries without any added sugar. That’s only if you want to take that healthfieid approach up a notch. I won’t judge you if don’t. NEVER EVER! Now let’s get our Gluten Free Cranberry White Chocolate Pumpkin Bars a BAKING before Christmas! 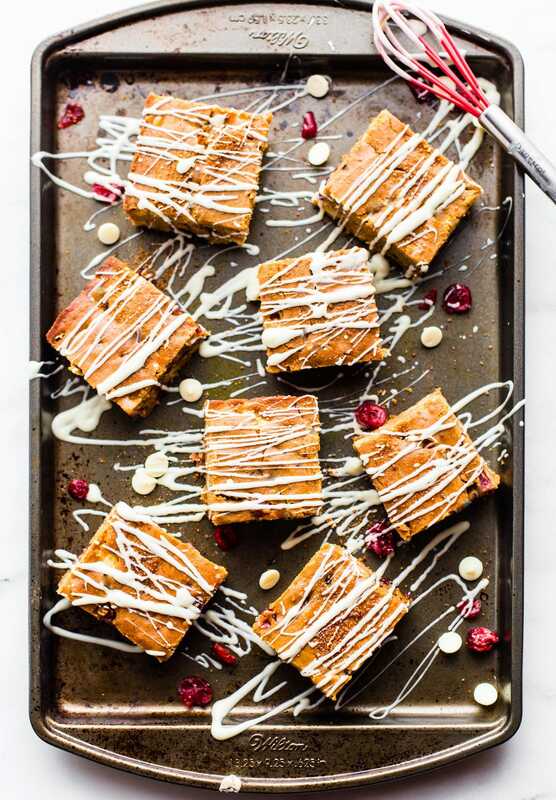 Healthier Cranberry White chocolate bars that taste like dessert! These gluten free cranberry white chocolate bars are made eggless with pumpkin and are super easy to make! Great for holidays or every day snacking! 2 tbsp of a starch flour. Like potato starch, tapioca starch, or arrowroot. I actually used [url] tigernut flour starch ∞http://amzn.to/2ewcXA9[/url] (a new grain free flour). It gives it a nutty flavor is a great grain flour alternative. Combine your dry ingredients first. Mix well. Then mix in your pumpkin, milk, vanilla extract, and coconut oil until batter is smooth. Make sure batter is not clumpy. Use a mixer if you need do. pour into 9×9 baking dish (greased) and bake at 350F for 25-30 minutes or until lightly brown on top and center is baked through. After cooled, drizzle melted baking chocolate (or vegan chocolate) on top. NOTES If you want them more moist, I would add in an egg or flax egg. Baking times will be different. Well, what do you think? Would these satisfy your sweet tooth? Hope so! YUM! 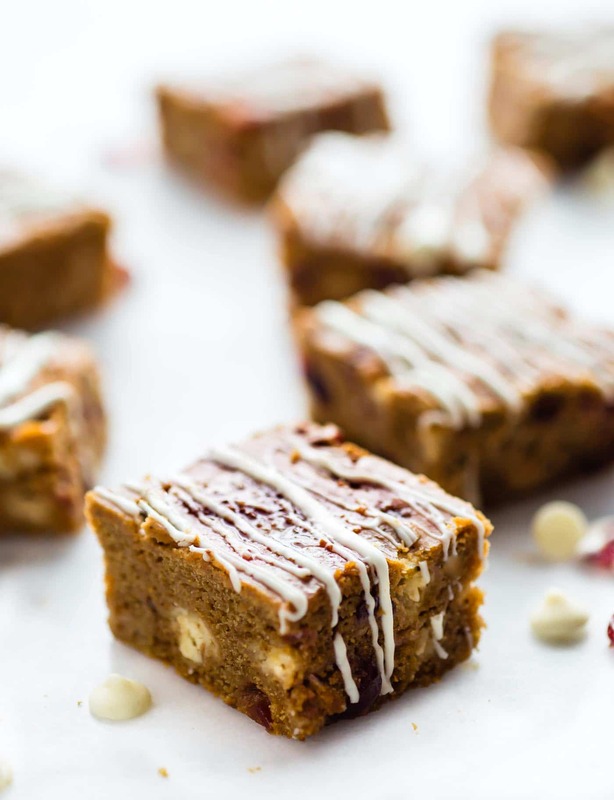 These Cranberry White chocolate Pumpkin bars must be made! #glutenfree #Vegan friendly! Have you ever tried tigernut flour? It’s a great gluten free and grain free flour alternative for those with nut/coconut allergies. What’s your definition of “healthified?” To each their own I say, yes! Other White Chocolate Desserts to try! White chocolate was my absolute favorite as a kid! I’m intrigued by the tiger nut flour because you know I love my resistant starch. 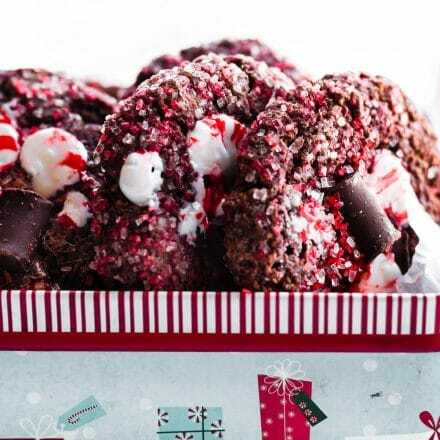 I will definitely be making these this holiday season! I used to love white chocolate and hate dark chocolate as a kid. Now I can’t get enough of dark chocolate! I’m not a white chocolate fan but I could seriously love these. The combo sounds amazing! All my favorite flavored in one place! I have a chocolate party to go to Sat night and now I know what to bring! Love the fall flavor combos here! 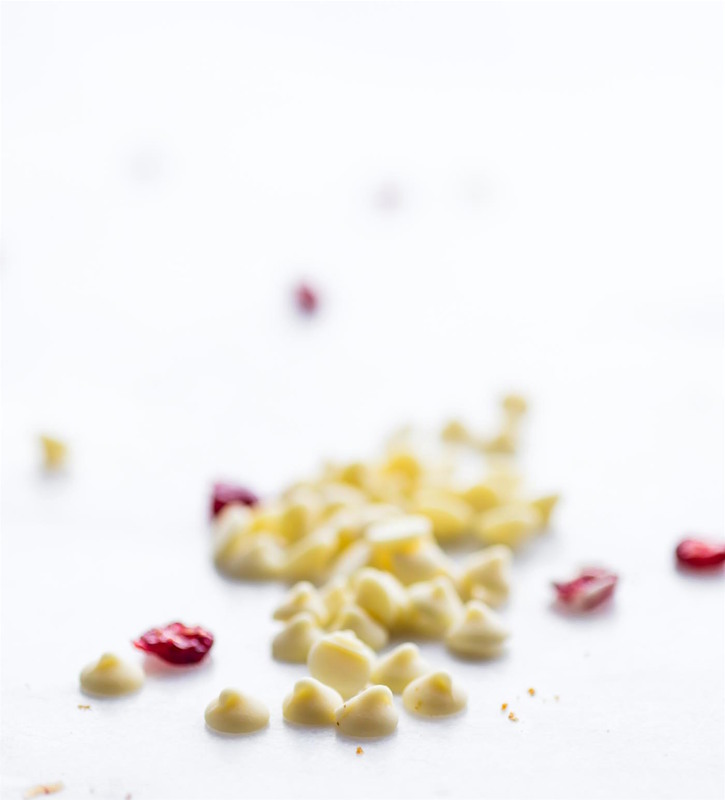 What a great idea to combine pumpkin and cranberries, and then add in the white chocolate to finish! Can’t wait to give these a try. oh i can’t wait to see your recipe! Seriously, this might be my favorite thing that you have ever made. One of my favorite flavor combos ever. I love what you did with his white chocolate!! These look incredible! This sounds delicious! I love pumpkin anything!! Trying these! And the dairy free version of the white chocolate chips! Yum. I remember my older sister alway requesting those huge white chocolate rabbits from the Eater bunny, that was one thing I never tried to steal from her! I never liked white chocolate. It’s not that I hate it, I just never chose it. I would eat it, enjoy it but want milk or dark instead. Tigernut flour?! Say whaaaaa? I’m going to look for that because now I’m curious. I’m all about this flavor combo–Kiwi has good tastes! must try tiger nut flour!!! can you believe Ive never tired WHITE CHOCOLATE?? Never been a fan of the white stuff, but these look to yummy to not try! Lindsay – you always have a cool product I have never heard of before – like this tiger nut flour! Thanks Lady! 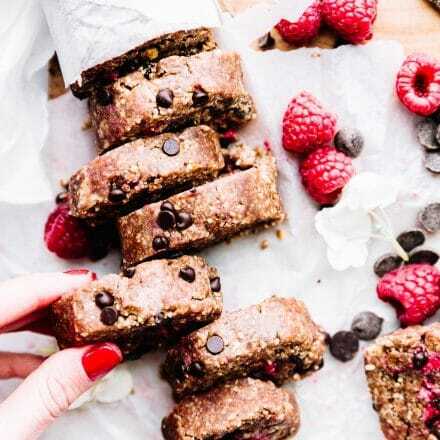 These bars sound perfect, yes, I eat white chocolate, but in very limited quantities – love your use of cranberries to balance of the sweetness of white chocolate! holy mackerel, these look amazing! James knows how to celebrate. I thought I was one of the few people that liked white chocolate! Yum, must make this weekend. yum! pumpkin and white chocolate is a killer combo. Oh girl, this has my name all over it. I am not a chocolate fan, but white chocolate? That’s a whole other story!!! I used to be SUPER anti white chocolate, but it has surpassed milk chocolate for me. Dark still wins, but white is so creamy and delicious. It can be a little too swee tthough. Pumpkin, cran, and white choc = an awesome fall flavor combo! Pinned this and I WILL be making it! Oh I loooove White chocolate. And the tigernut flour – so glad you guys love it! The tigernutbutter is crack. Seriously, Laura hated me for giving it to her when she was here. White chocolate is my guilty pleasure. I must try these! Mmmmm these sound so good! I love white chocolate around the holidays. I’d imagine the white chocolate in there would make these plenty sweet. These look fantastic!! Gonna whip up a batch sometime soon! Yummy!!! I didn’t realise you didn’t get milky bar in the US – we have them here in the UK! These look SO scrumptious! I love finding new clean recipes! I’m not a white chocolate person – for some reason it seems to “milky” to me (probably all in my head!). and coconut butter! your favorite! These look fantastic!! anytime you write about James’ favorite sweets, I think about that post race cheesecake he had here from Whole Foods and how Nala tried to drink his nespresso 😉 <3 miss you guys! I can’t wait to make these!! Can’t add them in to my macros right now but on the agenda in 2 weeks! One of my favorite fall flavor combos, my family loves pumpkin scones with white chocolate and cranberries. tigernut flour is the jam!!! feed me? maybe i need to make tiger balls? Your food photography is looking SO good! That bars look delicious. I’m working on it! Hoping to make a GF cookbook and Book of Bites! actually yes! i will be going though all my bite recipes again and would love to include some AIP bites! Ahhh! Send me an email with any details, please! Seriously, when are you moving in? LOL. I know someone else who has been eating chocolate since his off season started. I am a terrible baker. We need to figure out some kind of barter arrangement. yes we do! barter and bake! These look great! I’ll have to check out those dairy free white chocolates! i think you’ll love! and then they are vegan friendly, yay! Brilliant flavor combination! I can just imagine the flavors. Happily pinning. YUM!! i love anything and everything white chocolate!!!!! YUMMY! Pumpkin + cranberry = always a good idea. Add in some coconut butter and these sound awesome. I’m going to need to give TigerNut flour a try, especially around the holidays. Lovely lovely gut. Chocolate is totally a good way to end one season and start a rest season. For sure. These sound/look delicious! Gorgeous photos. Somebody made me a raspberry white chocolate scone at work yesterday. White chocolate is soooo good! ummm, all I have to say is YUM! Oh man, these look ridiculous. I love the cranberry/pumpkin/white chocolate combo. So Fall-y! I’m totally a secret fan of white chocolate… secret because I forget I love it until I eat it!!! I made these today for my family and everyone adored them! I added in 2 Tbsp. of xylitol, and used 1/2 cup oat flour + 1 cup quinoa flour since that’s what I had. You are a genius – everyone loved them, including me!! yay! i’m so glad. and way to improvise! I am a.sucker for anything white chicokate so I try to keep it out of the house so I don’t go overboard. Definitely my favorite kind of chocolate! Right? That’s how my husband is. He will eat it then say to take it away for fear of going overboard. LOL! no need to be embarrassed. Haha I did it too. LOL! Always. YEa! Keep me posted friend. And thank you. I recently bought 3 lbs of raw cocoa butter and have been making my own white chocolate…YUM! This is the perfect recipe to use it in! I just got back from the grocery store, where I bought cranberries and white chocolate chips for cookies. Now I want THESE instead! Perfect flavor combo! yes, I say make both! hehe! 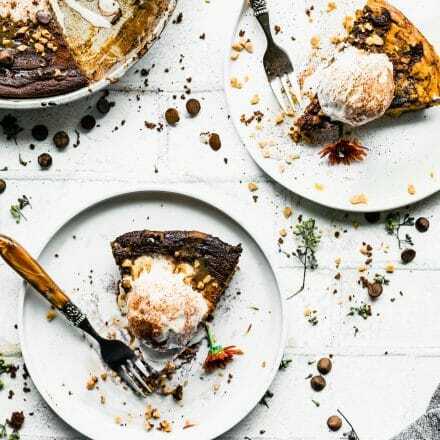 I’ve never tried tigernut flour but I’d love to try! I LOOOOVE white chocolate chips in baked goods, idk why haha! I think You’d Love Teff! It’s so fun to use in baking. And tasty! ACK! I need to fix that type. LOL! Thanks. Oh yummy!! For the GF mix… can you do a combo of like coconut flour & almond flour? sure! Although i think the baking time would be different and it won’t be as fluffy. Keep me posted! I know the holidays are over, but I’m such a sucker for winter desserts! Peppermint, gingerbread, snickerdoodle ANYTHING. HIT ME UP. 😀 Absolutely in love with these bars! The pumpkin flavor is absolutely perfect!